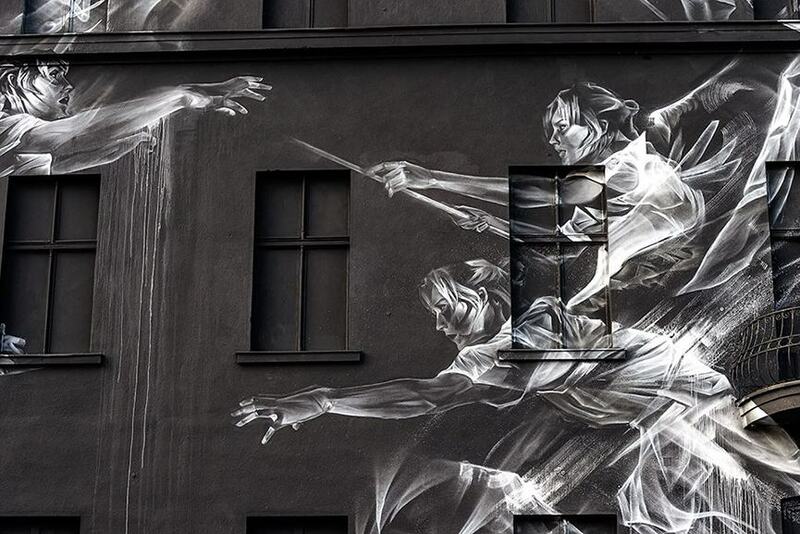 It is once again that time of the week when we take a look at some of the best public art pieces created on the streets worldwide, which many of you already saw on our Facebook page. But before we cut to the chase, let’s see what else is going on in the world of street and urban art. Nuart festival is now behind us and you can read more about the outcome in our final report. 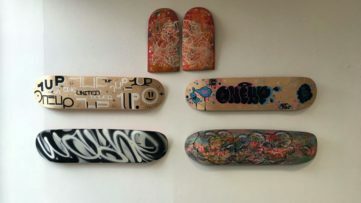 In the past two days, the debates has been sparked over Cope2’s arrest and the artist somewhat clarified the incident in an exclusive statement for Widewalls. Since we are officially entering the autumn season soon, many street art related events will occur at the exhibition spaces. There are definitely some interesting shows to visit like Graffiti. New York Meets the Dam exhibition in Amsterdam and also the works of the Belgian artist Steve Locatelli on display at 44309 STREET//ART GALLERY. For all of you JR fans out there, if you were wondering what is going on with your favorite artist, and why he is nowhere to be seen, the answer is he was busy preparing his retrospective exhibition in Paris. Some great news is coming from New York where Vermibus’s new art project started and you can check out the first results and find out more about the project in our interview with the artist. 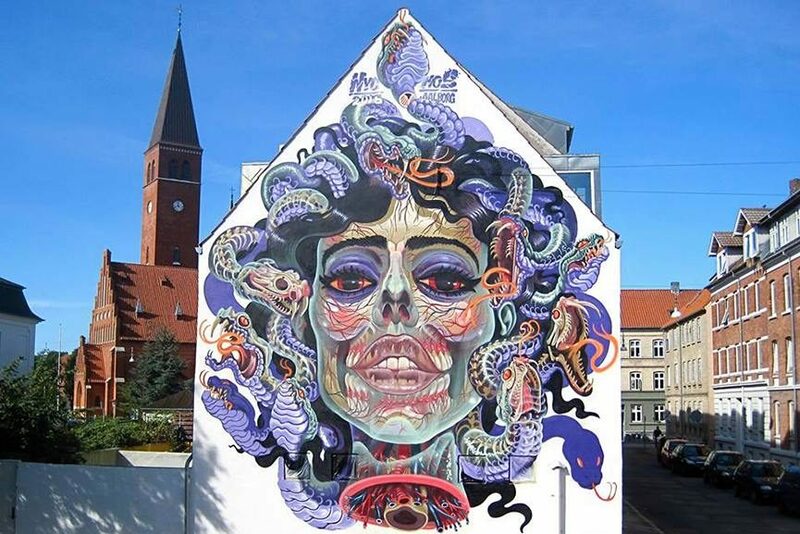 Austrian artist Nychos was one of the participants in WEAArt festival, one of the first festivals in Denmark focusing only on murals. The painting took place in the city of Aalborg which is now richer for another astonishing public art piece. Entitled Translucent Medusa the artwork depicts a mythical female creature with venomous snakes in place of her hair. Famous for his depictions of dissected human and animal bodies, Nychos took a somewhat different turn in the creation of this piece. Rather than dissecting figures, he covered their skeletons with the translucent masks staying true to his style but also experimenting with the imagery we are used to see from this artist. 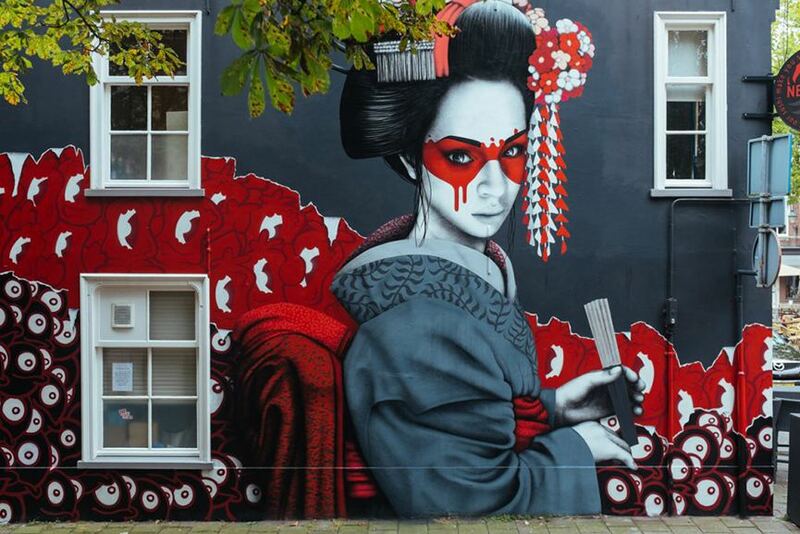 Fin DAC recently visited Netherlands where he finished working on one of his signature pieces. 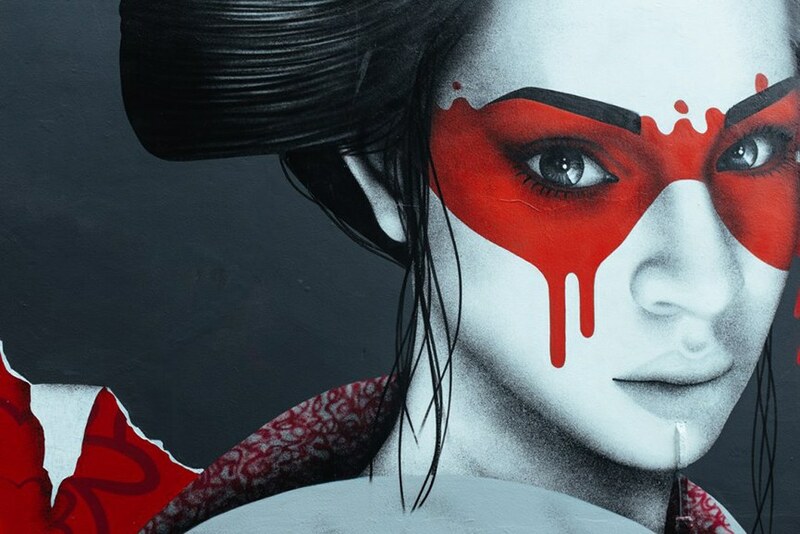 A recognizable portrait of a geisha, Fin Dac’s permanent source of inspiration, was done in collaboration with the Dutch artists Edo Rath and Michael Nol who are responsible for the playful and colorful background which truly enhances the overall impression of the piece. 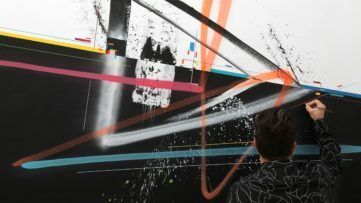 The painting of the mural was supported by the Graphic Design Festival Breda and Vroom & Varossieau Urban Contemporary Art, the two initiators of the Blind Wall Gallery project. Entitled Kokesh, this mural marks the beginning of the project and it will proudly be showcased in the months to come, along with the works of many national and international artists, as part of the upcoming open air exhibition in Breda, Netherlands. One of our regular Street Update guests, Balinese artist WD was pretty quiet for a week, but he is definitely back with his new mural created on Greek island Naxos. The title of the mural is No Place like Home and it is a bit ironic since the piece was painted in a deteriorated interior of an abandoned hotel. WD aka Wild Drawing brought to life two furry guardians of the deserted place, armed and ready to scare off all potential visitors. Last week, Canadian artist Li-Hill, finished working on one of his pieces in the city of Berlin. 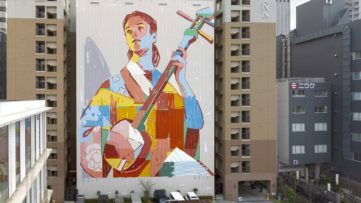 The mural is Li-Hill’s largest piece so far and it was done with the support of the Urban Nation. 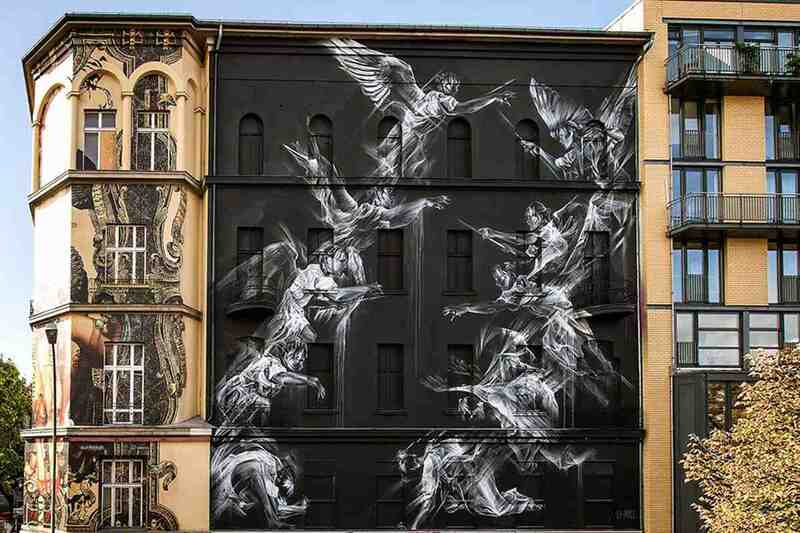 Five stories high and entitled Rise and Fall, this mural brings the story inspired by the Berlin’s famous statue of Victory goddess, as well as the film Wings of Desire directed by Wim Winders centered around the story of an angel who experiences the world through the eyes of human. Built around the concept of rebirth and renewal the piece is one of the greatest achievements in Li-Hills career and also a great contribution to the One Wall project. 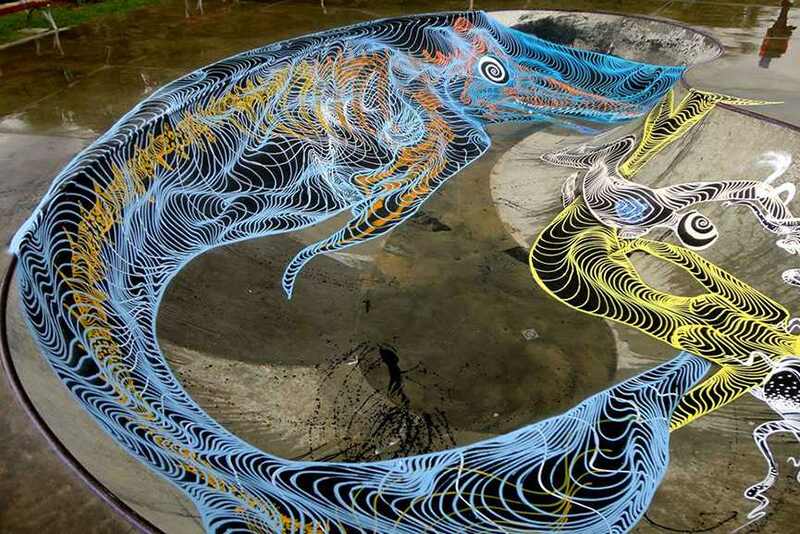 Italian street artist AweR was recently in Bulgaria where he decorated one of the local skate parks in the city of Dobrich. 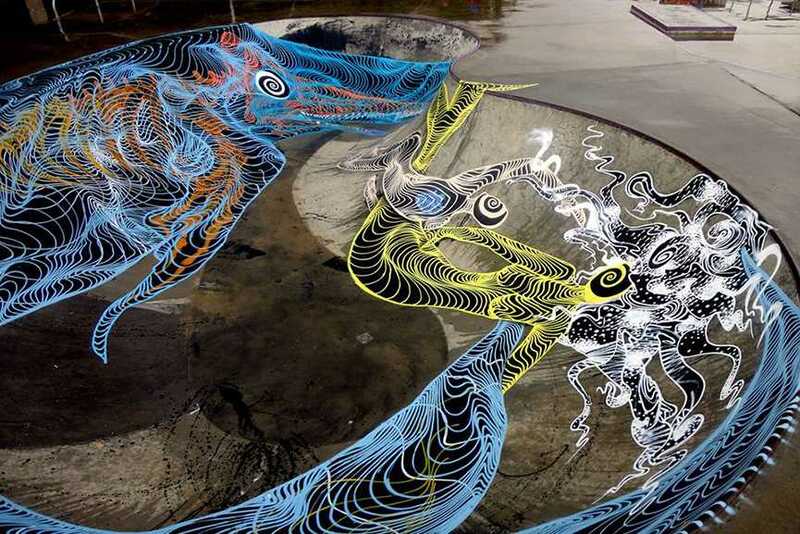 The Bulgarian city was the host of the WUWEK festival, international sports and street art event, and AweR decided to join in on the action and leave the city’s skate park richer for his large and hypnotic street art piece. In his signature style, AweR created a fluorescent representation of the sea creature, followed by the figure of a diver interacting with a mermaid. The piece is well-incorporated into its surroundings and it will surely be a treat for all young skaters in Dobrich. 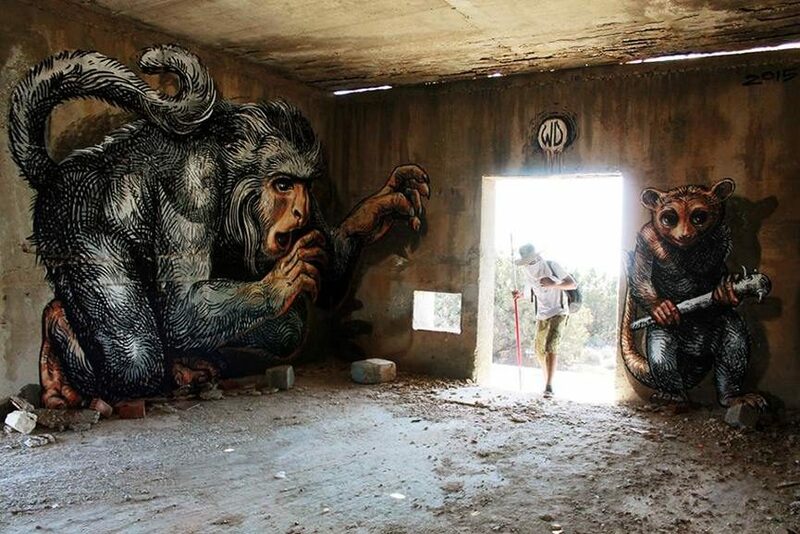 Discover the finest murals all over the world with a FREE sign up for My Widewalls!